Home » Blog » What are the Benefits to a PICC-Trained Nursing Professional? Traditionally, the role of nurses in peripherally inserted central catheter (PICC) line placement has been extremely limited. It has been a long-standing practice for PICC insertion to only be performed by board-certified radiologists and assistants who have been trained in vascular interventional procedures. Despite growing evidence that "nurses can add efficiency to an overwhelmed interventional radiology department, provide competent PICC line placement, reduce costs and procedure delays for the patient,"* nurses usually have not been fully exposed to training that would enable them to properly perform this oftentimes essential procedure. But, things are changing. Organizations which regulate and standardize infusions and vascular access standards are starting to acknowledge the efficacy of educating nurses in PICC placement. It is becoming more commonplace (at least, currently, in the U.S. and Canada) for such training to be included within the general scope of nursing practice. Many nurses get little to no [infusion] education in nursing school, and are expected to be skilled once they’re in practice. Lack of knowledge of the standards, on-the-job training, and perpetuating traditions not supported by current evidence are factors that jeopardize the ability to prevent risk and provide safe infusion care. Providing curriculum in nursing (and medical) schools to better prepare graduates and increasing awareness of the standards for application in clinical practice are steps to address this issue." PICC lines are often adviseable for patients requiring long-term venous access. When implemented properly, a PICC line can be a safe and effective way to administer intravenous medications and other therapeutic fluids. Nurses who are skilled in correctly delivering and maintaining PICC lines (trained in both PICC regulatory standards and protocols, and evaluated in theoretical content with clinical instruction on an anatomical model) can offer tremendous benefit to the healthcare community and patient care. With consistent up-to-date training, nurses can improve skills in venipuncture and IV catheter insertion, resulting in the ability to competently insert a catheter in a patient with good venous access, and avoid the risk of patient complications. PICC-trained nurses can provide interventional radiology departments with significant cost-reduction benefits. This is because PICC line insertion in the radiology suite (performed by a radiology specialist) is often more expensive than the bedside ultrasound-guided technique. Specialist clinicians rarely have post-procedural exposure to patients on a daily basis. However, nurses routinely attend to the recuperative needs of patients and, if trained in ultrasound-guided needle insertion and site maintenance, can provide timely assessment of the functionality of the venous access site, reassess the continued need of the catheter, and can readily answer questions relative to ongoing treatment and patient recovery. Providing nurses with access to quality training in PICC line placement protocols can positively impact the nursing profession and make better use of valuable healthcare resources. It can also improve the standard of care as it relates to patient experience and overall patient safety. 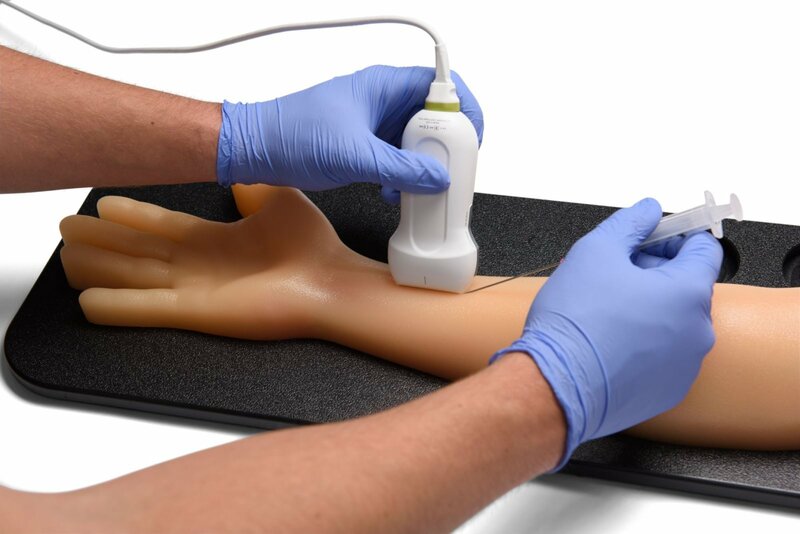 Designed to assist users in learning to place needles, guidewires, and catheters within the brachial vein, basilic vein, radial artery, ulnar artery and superficial veins, this highly reliable and durable PICC training arm is ideal for nursing programs. Users can practice catheter placement verification with the "ultrasoundable chest portion" that contains the superior vena cava and subclavian vein. Correct catheter placement may also be verified by x-ray.